Bosch Jobber Length Drill Bit, 5/32 in Diameter, 3-1/8 in Overall Length, 3-1/8 in Cutting Depth, Twist Flute, 5/32 in Shank, Flat, Straight Shank, 135 deg Point, Split Point, Titanium Coated, CSA Certified, OSHA Approved, cUL, UL Listed, For General Purpose Drilling Applications Use the Foam Sleeve for picking up wet messes when used alone. The Foam Sleeve is also required when using reusable disc style filters. Approximate size of sleeve: 8" diameter and 6.5" high. For picking up wet messes. Will only fit Micro wet/dry vac SKU# 908.5713. M7 grade steel with extra hard titanium coating and parabolic bit flutes for strength and maximum service in applications such as metal, wood and plastic; split point prevents walking. M7 grade steel with extra hard titanium coating and parabolic bit flutes for strength and maximum service in applications such as metal, wood and plastic; split point prevents walking. Titanium Nitride coating reduces friction and last longer, cutting edge stays sharper longer. Split point eliminates the need for a center punch and keeps the drill from skating. All sizes 3/16" and larger have three flats on the shank for a better grip on chuck. 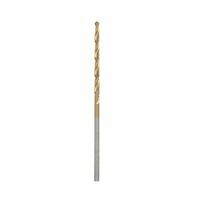 Bosch Jobber Length Drill Bit, 1/4 in Diameter, 4 in Overall Length, Twist Flute, 1/4 in Shank, Flat, Straight Shank, 135 deg Point, Split Point, Titanium Coated, Applicable Materials: Sheet Metal Ducts, Steel, Copper, Brass, Aluminum, Plastic, Plexiglas, Wood, Veneers, Vinyl Siding, Plasterboard, PVC, Stainless Steel and Cast Iron For efficient dry filtering. Use in combination with foam sleeve No.905-85 (SKU 659.2984). Reusable, easy to wash. Includes easy to use mounting ring. Titanium Nitride coating reduces friction and last longer, cutting edge stays sharper longer. Split point eliminates the need for a center punch and keeps the drill from skating. All sizes 3/16" and larger have three flats on the shank for a better grip on chuck. Titanium Nitride coating reduces friction and last longer, cutting edge stays sharper longer. Split point eliminates the need for a center punch and keeps the drill from skating. All sizes 3/16" and larger have three flats on the shank for a better grip on chuck. M7 grade steel with extra hard titanium coating and parabolic bit flutes for strength and maximum service in applications such as metal, wood and plastic; split point prevents walking. Titanium Nitride coating reduces friction and last longer, cutting edge stays sharper longer. Split point eliminates the need for a center punch and keeps the drill from skating. All sizes 3/16" and larger have three flats on the shank for a better grip on chuck. Titanium Nitride coating reduces friction and last longer, cutting edge stays sharper longer. Split point eliminates the need for a center punch and keeps the drill from skating. All sizes 3/16" and larger have three flats on the shank for a better grip on chuck. M7 grade steel with extra hard titanium coating and parabolic bit flutes for strength and maximum service in applications such as metal, wood and plastic; split point prevents walking. For small, dry debris. Fits Hang Up Vacs, 5 Gallon Contractor Portable, Floormaster Plus, All Around Plus, Heavy Duty Portable and all arounds with 1-1/2 and 2 gallon tank sizes. Titanium Nitride coating reduces friction and last longer, cutting edge stays sharper longer. Used in repetitive metal drilling with portable drills or stationary drill press. Jobber length. Made of durable Dacron material. Must use in combination with foam sleeve No.905-85 (SKU 659.2984) for larger dry debris materials. Reusable, easy to wash. M7 grade steel with extra hard titanium coating and parabolic bit flutes for strength and maximum service in applications such as metal, wood and plastic; split point prevents walking. Titanium nitride coating and reinforced web for longer life added strength and durability. Turbomaxtip for burr-free holes; exact centering with walking on straight and curved surfaces; three flatted shank on 3/16" and above for better chuck grip. Titanium Nitride coating reduces friction and last longer, cutting edge stays sharper longer. Used in repetitive metal drilling with portable drills or stationary drill press. Jobber length. For small dry debris and wet materials. Fits most Shop-Vac wet/dry vacs except 1X1, Bulldog Portable, Mighty Mini, Hippo, Hang Up Vacs, or AllAround Series. The dimensions are 7" H x 7.5" Dia outside. Inside diam 5.75" x 6.5" without retainer. Washable wet/dry replacement filter for Rigid Branded vacuums. Easy to clean. M7 grade steel with extra hard titanium coating and parabolic bit flutes for strength and maximum service in applications such as metal, wood and plastic; split point prevents walking. Up to 5 times more efficient. Nanofibers for small, dry debris and wet materials like cold fireplace ash, auto refinishing, cement dust, sawdust, and drywall dust. Designed to combat your toughest challenge, can be used for both wet and dry pick-up and fits most Shop-Vac wet/dry Vacs. (Does not fit 1x1, BullDog Portable, Mighty Mini, Hippo, or All Around Series). Bosch Jobber Drill Bit, 1/2 in Diameter, 6 in Overall Length, Twist Flute, 3/8 in Shank, Straight Shank, 135 deg Point, Split Point, Titanium Coated, Applicable Materials: Sheet Metal Ducts, Steel, Copper, Brass, Aluminum, Plastic, Plexiglas, Wood, Veneers, Vinyl Siding, Plasterboard, PVC, Stainless Steel and Cast Iron Special cartridge filter for both wet and dry pick-up. Maintains suction power even when used with fine debris like drywall dust. Resists clogging, easy to clean, just tap or rinse, reusable with nonstick surface. Fits Craftsman and Rigid wet/dry vacs and full size vacs. It is not recommended for wet pickup. If used for wet pickup it can reduce the life of the filter. Incredibly versatile tool for home projects, repairs and remodeling. 21,000 OPM for fast sanding, grinding, cutting, sawing and scraping. 4 pin flange design holds accessories firmly in place. Includes 3" delta sanding pad, assorted sandpaper, scraping blade, 30mm E-cut saw blades, HSS segment saw blade, Allen wrench and accessory storage box. Powerful performance for most trimming, small edge forming, decorative woodworking and hinge routing applications. Quick adjust button that allows for quick adjustment up to 1''. Spindle lock button allows for single wrench bit changes. Allows for quick depth adjustment up to 5/8''. Variable speed allows for precision performance that's right for each job. Oscillating tool with Universal Fit blade system. Variable speed 11,000-20,000 oscillations provide the right speed for various tasks. 3.2? oscillation angle. 10 ft cord to allow most uses without an extension cord. Lightweight at only 2 lbs. Included accessories: (1) end cut blade, (1) semi circle blade, (1) key and (1) sanding pad with 3 sheets of paper. For home repair, remodeling and restoration. Use as a detail sander, flush and plunge cut saw, drywall cut-out tool, power scraper, grout removal tool and more. Tool-free quick-change accessory system. Powerful 2.5 amp motor. Variable speed (15,000-22,000 OPM) for versatility. 6-pin flange design holds accessories firmly in place. Weighs only 3.2 lbs. Die-cast aluminum gear housing. Includes: 3" delta sanding pad, (12) sanding triangles, rigid scraper blade, 1-3/8" (35mm) Bi-metal flush cut blade, HSS segmented saw blade, 1-3/4" coarse tooth flush cut blade and accessory storage box. 2.5 amp oscillating tool with Universal Fit blade system. Variable speed 11,000 to 20,000 oscillations provide the right speed for various tasks. 3.2 degree oscillation angle. 6.5 ft. cord to allow most uses without an extension cord. Lightweight at only 2.5 lbs. Includes: (1) end cut blade, (1) semi circle blade, (1) sanding pad with 3 sheets of paper and (1) key. Tool free bit change for fast and easy bit changing without a wrench, turn on/bump-off switch, slim body design for less fatigue over prolonged use, dust-Sealed Switch protects against dust ingestion for longer switch life. Specs: 5.0Amps no load speed 30,000 RPM, collet diameter 1/8", 1/4", adjustable guide, spindle lock, 10" length, weight 3.2lbs. 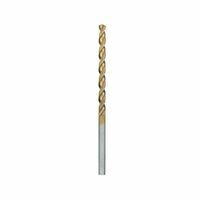 Includes: (1) drywall cutting bit, 1/4", 1/8" collets. Designed to tackle plunge and feehand cuts in nearly any building material. Compatible with all XBits and ZipBits. Specs: 30,000 rpm MagnaCore motor, dual grip zones, spiral system, bump switch, dust victoring exhaust vents. Weighs 3 lbs. Includes a drywall guidepoint ZipBits, a multipurpose ZipBits, and 1/8", 5/32", and 1/4" collets. Saw can be used wet or dry, cuts tile, stone, concrete, brick, fiber cement siding, stucco, and pavers. Specs: 11,800 RPM, 15.2"Lx10.5"Wx9.5"H; weight 14.1 ounces Includes: laser cutting guide to help make straight cuts. High torque motor for long life and deep cutting capacity, deep cutting capacity removes more material in a single pass, lock on button for added convenience during extended use, chamfering groove for decorative edging, front depth adjustment handle, 4 solid reversible HSS blades, 10 positive stops for accurate and precise material removal, vacuum dust adapter provides connection port for vacuum. Specs: 16,500RPM, 5/64" deep cutting capacity, 5/16" rabbeting depth capacity. Includes: planer, (4) reversible HSS blades, edge guide, dust bag, vacuum adapter, hex wrench, user's guide, kit box. Tool free release lever eliminates the need for a hex key. Variable speed dial has six speed settings. Includes rigid scraper, 1 in wood/metal blade, 12 sandpaper sheets, sanding base and carrying bag. Specifications: 120 voltage, 10,000-20,000 rpm, AC power source and 1.4 degrees oscillating angle. Weighs 4.5 Lbs. Delivers for pros who need to plane doors or other surfaces quickly and evenly. 6.5 amp motor produces 16,500 rpm for fast stock removal and smooth finishes. The tool's ambidextrous lock-off release button helps prevent accidental starts and has a lock-on button for extended operation. The aluminum front and rear shoes are precision machined together for accuracy and the tool has a machined groove for chamfering. Its counterbalanced blade design puts the blade at an ideal cutting angle and eliminates uneven planing caused by misaligned blades. Weighs only 6.3 lbs. It comes equipped with a reversible Bosch Woodrazor micro grain carbide blade. The tool also provides a spring loaded stand that elevates the planer to protect the blade. The dual mount guide fence can be mounted on either side of the tool, with a plastic overshoe that offers protection for the work-piece surface. The dust port accommodates a large shavings bag. This planer is built with a poly micro-V drive belt for enhanced belt durability and a ball joint cord swivel for enhanced ease of positioning the tool and cord. Includes (1) Reversible Woodrazor blade, (1) Dual-mount guide fence, (1) No-mar plastic overshoe for fence, (1) shavings bag and (1) blade wrench. Hyperlock tool-free blade change system provides 1 ton of clamping force to prevent blade slippage. Universal Fit System accepts other major brand accessories. Higher oscillation angle provides unrivaled speed of cut. Powerful 4.0 amp motor with constant speed control won't stall. Variable speed dial for precision control. 33 piece kit includes a variety of blades and sanding attachments for a wide range of applications. Voltage 120V-60Hz. Oscillation speed 11000-20000 opm. Oscillation angle 5?. Cord length 10 feet. Tool weighs only 3.3 lbs. Features include the smooth rack-and-pinion fine depth adjustment system for more precise settings, dual L.E.D. lights to illuminate the work surface, and a quick release cam lock system for convenient depth adjustments and base removal/installation. Aluminum housing and base for increased durability and accuracy. Brushless motor efficiently uses energy to match torque and RPM to the changing demands of the application. On/Off button with separate lock button helps prevent accidental start-up of the tool for user and workpiece protection. Soft start feature for smoother start-ups and better accuracy. Specs: 10,000 - 30,000 RPM, 1-9/16" plunge capacity, fixed base, 5-1/4" length, and 4.5 lbs weight with battery. Includes: 1/4" and 3/8" collet, (2) spanner wrenches, (1) straight guide, template guide, wrenches (battery and charger not included). Cuts mild steel sheet metal up to 18 gauge with a rugged 4.8 amp motor; cuts smooth, fast and there is no dust or shards to clean up. Tool free system blade change allows quick changes and adjustments for specific applications without wrenches and bolts. Depth and cutting guide helps complete plunge and cutting tasks faster and with more control. 3 position over mold provides gripping are on the front, middle and rear to improve comfort by reducing vibration. Includes a depth/cutting guide, precision wood end-cut, flush cut blade, sanding platen, 25 sandpaper sheets, flexible scraper and kit box. Specs: 10,000-22,000 opm, 2.8 Oscillation angle, 11" length, 10 ft cord and weighs 3.7 lbs. Motor provides a smooth, even finish in the hardest of woods with resharpenable high speed steel blades also accepts reversible carbide blades, calibrated depth adjustment knob. Precision machined front and back aluminum shoes with groove in front shoe, kickstand, poly-V drive belt, ergonomic handle. Specs: 17,000 rpm no load speed, 1.5mm/1/16" depth of cut, 3-1/4" planning width, 23/64" rabbeting depth, weighs 6.0 lbs. Includes: (2) resharpenable high-speed steel blades (installed), (1) rabbeting fence, (1) blade depth setting gage, (1) blade resharpening tool and (1) socket wrench. Micro-fine depth adjustment ring in 1/64" increment, adjustable tool-free steel motor cam lock with quick release motor latches, adjustable, tool free steel motor cam lock, quick release motor latches, detachable cordset, clear, Lexan sub base, rubber overmolded handles, right or left switch and cordset location, flat top, self releasing, long, eight slotted collets. Specs: 24,500 RPM, collet diameter 1/2", 1/4", depth stop micro-fine ring, 6" base dimension, 7.1lbs. tool weight. Includes: fixed base router, 1/4" and 1/2" one piece self-releasing collets, (2) wrenches and sub base concentricity gauge. Powerful 10.8 amp (1,300 watts) motor delivers the cutting power to cut through granite, porcelain, concrete and other stone materials. Premium 4-3/8" diamond blade allows the user to cut ceramics and stone materials up to 1-3/8" deep wet or dry. At 13,000 rpm max no load speed, it provides plenty of speed to complete the user applications. Bevels to 45? for quick and precise angle cuts. 12' water line feeds water to the blade decreasing dust in and increasing blade performance and life. Lock-on button reduces user fatigue during production cuts. Adjustable depth of cut allows user to cut at various depths. Dust sealed switch protects the unit from contamination and prolongs the life of the unit. Rubber overmold grip provides increased user comfort and ergonomics. 20mm" Arbor size. Weighs only 6.6 lbs. Micrometer depth adjustor accurate to 1/128", cam lock lever enables simple coarse height adjustments and motor release (fixed base), dust sealed switch and sealed ball bearing construction, precision machined aluminum motor housing and base, auto release collet system for easy bit removal after use, collets included to accept 1/4" and 1/2" shank bits, under table stop, overmolded grips. Specs: 1-3/4 peak HP, 120V/AC, 25-60 Hz, 27,500RPM, 3-1/2" motor diameter, 1/4" & 1/2" collets, round base, LxWxH is 12"x5.5"x8-5/8", weighs 8lbs. Includes: router motor, fixed base, 1/4" & 1/2" collets, (1) collet wrench, carrying case, operating manual. High power-to-weight ratio, two-blade cutter head, equipped with double edge carbide blades, easy blade setting system, machined aluminum base, rigid die-cast aluminum housing with all ball bearing construction,machined aluminum and balanced planer drum, lock on button, depth adjustment knob with easy to read scale, rubberized front and rear handles, spring-loaded stand, poly-v belt, double insulated. Specs: 3-1/4" planing width, 3/32" planing depth, no load RPM 17,000, size (LxWxH) 11-1/4"x6-1/4"x6-1/8", weighs 5.7lbs. Includes: blade gauge assembly, wrench, guide rule, blade set, tool case. Micrometer depth adjustor accurate to 1/128", Cam lock lever enables simple coarse height adjustments and motor release, precision machined aluminum motor housing and base, dust sealed switch and sealed ball bearing construction, auto release collet system allows for easy bit removal, collets included to accept 1/4" and 1/2" shank bits, Under table stop prevents motor from inadvertently rotating out of base, Over molded grips for greater comfort. Specs: 120V/AC, 25-60Hz, 27,500RPM, 3-1/2" motor diameter, 1/4" & 1/2" collets, 5-3/4" round base, LxWxH (12"x5.5"x8-5/8"), weighs 8lbs. Includes: router motor,1/4" & 1/2" collets, collet wrench, operating manual. 3.4 degree and 5 degree Duotech Oscillation technology puts speed and control into one tool ensuring you have the proper power and precision no matter what type of cut you're making. Lets you select between 2 modes: power and precision, to fit your job. Use the 3.4 degree angle for controlled cuts or switch to the 5 degree angle for faster cuts. Universal fit system accepts other major brand accessories. Powerful 4.2 amp motor with constant speed control. Hyperlock tool-free clamp provides 1 ton of force to prevent slipping. Variable speed dial allows for precision control, while Rockwell's Vibrafree counterweight offsets vibration for a smooth cut. Includes 10 accessories, plus a hard carrying case. Variable speed control with soft starting motor features full time electronic feedback that maintains motor speed through the cut. Dual LED's and clear sub base ensure maximum visibility, adjustment ring enables controlled bit depth changes, large, low-pressure spindle lock button, multiple shaft lock detents, depth ring, clamping mechanism and spring loaded release tabs. Specs: 7.0 amps, 16,000-27,000 RPM no load speed, 1/4" collet diameter, 1.5" plunge stroke, 4" base dimension, 12 position spindle lock, weighs 4.1 lbs. Includes: motor, standard base, wrench and instruction manual. Cuts fiber cement siding up to 5/16" thick. Smooth, fast, and dust-free operation. Reversible blades, machined from solid tool steel. Powerful 250 watt Fein high performance motor for optimal cutting speeds and maximum work progress. . High quality and stability thanks to metal gear case and consistent use of ball or needle bearings. 11,000-20,000 OPM. Lightweight cutting at only 3.1 lbs. Tool cord length is 16'4". Convenient quick change clamping system. Electronic speed control with generator for constant speed, even under load. Integrated interface for mounting additional accessories. Starlock mounting for ideal torque transfer. Kit includes: 1 FEIN MultiMaster FMM250QSL, 1 backing pad, 3 of each sanding sheets (80, 120, 180 grit), 1 Universal E-Cut blade 1-3/4" long and a nylon bag for storage. Variable speed dial for matching speed to workpiece and task. Macro and microfine bit depth adjustment system with re-settable depth indicator. Precision centering design makes it easy to keep bit on intended cutline when using jigs, templets, dovetail fixtures and similar guidance devices. Right or left switch location for user preference and consistency. Classic hardwood handles. One-piece armature shaft. Soft start reduces start-up torque. Constant Response circuitry maintains constant speed under load. Provides overload protection. RA1161 Fixed base with system has threaded holes for mounting to router table positioned in common 3-hole pattern. Includes 1/4" and 1/2" S.R. collet chuck, 16mm shaft wrench, collet nut wrench, chip shield, 10 ft. flexible rubber cord and t-handle hex height adjustment wrench. Spec: 6" base diameter, 3-3/4" base opening, 1/4", 1/2", and 8mm collet capacity, 10' cord length, 8,000 - 25,000, 120 V AC rating, and 2" subbase opening. Linear depth adjustment features a large steel motor lock lever and depth adjustment gearing via a durable threaded screw integral to the motor itself; both coarse and microfine adjustments are fast and accurate, over molded rubber grip with an adjustable handstrap that allows for left and right handed operation, and two over molded palm grip side handles for superior comfort, router sub base includes a special access hole for a common 3/8" hex extension wrench for above the table depth adjustments. Specs: Max HP 1.7, no load RPM 24,000, collet diameter 1/4"-1/2", depth adjustment range 1-21/32", 6" base dimensions, 8ft, fixed cord, double insulated, rocker switch, 8-1/2" high, weighs 8.8lbs. Includes: (1) router, (2) 1-1/8" collet wrenches, 1/2" & 1/4" collets, carrying case. Rental. Brushless motor provides power and run-time. 5/64" (2mm) maximum depth of cut. Precision-machined front and back aluminum shoes ensure parallelism of cut. Precision machined groove in front shoe allows for edge chamfering. Ergonomically designed handle provides greater comfort and less fatigue. 20 volt Max; 32,000 cuts per minute achieve a fast removal rate. Calibrated depth adjustment knob to 1/16" (1.5mm approximately). Kickstand allows user to rest the planer on work surface without gouging the material. Poly-V belt provides increased belt durability. No load speed 15000 rpm. Tool weighs 5.5 lbs. Includes user's guide, guide fence and wrench. BATTERY AND CHARGER NOT INCLUDED. Powerful 3.0 amp motor provides strong performance for cutting and sanding. Quick change accessory system allows blades and attachments to be changed quickly without wrenches. Dual-Grip variable speed trigger gives users ultimate speed and application control. Bright LED light illuminates dark work surfaces for accurate cutting. Allow users to set the depth or height for accurate repeatability. 29 piece accessory kit includes: wood with nails blade, fast cut wood blade, semi-circle blade, sanding pad, 25 sheets of sand paper, Dewalt Oscillating tool guide system, accessory storage box, multi-brand accessory adaptor and contractor bag. Variable speed trigger, lightweight, heavy-duty magnesium gear case, 360 degree swivel head, ergonomic tactile grip. Specs: 120V/AC, 0-2,500 SPM, Capacity in: (steel-18 gauge) (stainless-20 gauge), double insulated, trigger lock, 7" minimum cutting radius, 10 ft. fixed cord, 12-1/4" long, weighs 4.1 lbs. Includes: hex wrench. Micrometer depth adjustor accurate to 1/128", GripVac handle allows for both single hand gripping and enhanced router control when used in conjunction with standard knob, D-handle incorporates trigger switch with lock-on feature, precision machined aluminum motor housing and base, dust sealed switch and sealed ball bearing construction enhance tool durability, auto release collet system allows for easy bit removal, collets included to accept 1/4" and 1/2" shank bits. Specs: 120V/AC, 25-60Hz, 27,500RPM, 3-1/2" motor diameter, 1/4" & 1/2" collets, round base, trigger switch, LxWxH (10.5"x7.75"x8-5/8"), weighs 9.25lbs. Includes: router motor, D-handle base, 1/4" & 1/2" collets, collet wrench, operating manual. Variable speed dial, all ball-bearing motor for long life, head swivels 360 degrees, cuts 7/32" strip which continuously curls out of cutting area for clear line of sight, cuts radius of 5-1/2" and larger. Specs: max watts out 470W, strokes/min 0-2,500 SPM, capacity in: (mild steel) 18 gauge (stainless steel) 20 gauge, replacement parts: left/right blade, center blade, 9.1" long, weighs 5.0 lbs. Self-supporting motor with vibration decoupling for ideal vibration and noise reduction. Powerful 350 watt Fein high performance motor for optimal cutting speeds and maximum work progress. High quality and stability thanks to metal gear case and consistent use of ball or needle bearings. Lightweight cutting at only 3.1 lbs. Tool cord length is 16'4". Convenient quick change clamping system. Electronic speed control with generator for constant speed, even under load. Integrated interface for mounting additional accessories. Soft-grip zone provides optimal handling. Starlock mounting for ideal torque transfer. Kit includes: 1 FEIN MultiMaster FMM350QSL, 1 backing pad, 3 of each sanding sheets (80, 120, 180 grit), 1 universal E-Cut blade 1-3/4" long and a nylon bag for storage. Variable speed control enables bit speed to be optimized for changing applications, rack and pinion adjustment provides fine depth, settings to 1/128", dual position switch allows user to cut power while maintaining control of the router, overmolded grips for greater comfort in extended use, spindle lock for single wrench bit changes, durable latch lever, collets included to accept 1/4" and 1/2" shank bits. Specs: 120V/AC, 60Hz, no load speed 10,000-23,000RPM, 3-1/2" motor diameter, 1/4" & 1/2" collets, round base, 9"l x6"w, height: At Zero-9.9", tallest-11.1", weighs 9lbs. Includes: router motor, fixed base, 1/4" & 1/2" collets, collet wrench, carrying case, operating manual. Electronic variable speed with full feedback control for constant speed under load and soft start to reduce start up torque, micro fine depth adjustment ring provides precise depth adjustments in 1/64" increments, adjustable, tool free steel motor cam lock, through-the-column dust collection, quick release motor latches, detachable cordset, subbase concentricity gauge, machined brass bushings and case-hardened steel guide rods, spindle lock button, clear, Lexan subbase provides enhanced base durability, bit visibility, and accepts standard template guide bushings, rubber overmolded handles and low center of gravity, dust sealed switch, heavy duty, precision machined, die-cast aluminum base and motor housing, nickel plated motor housing. Right or left switch and cordset location, flat top, self-releasing, long, eight slotted collets, five position, adjustable turret, micro fine depth adjustment on plunge base 5/128" per turn for precise routing in veneer and inlays, easy to reach plunge lever and switch. Specs: no load speed 8,000-24,000RPM, 1/4" & 1/2" collets, plunge stroke-2-1/2", depth stop micro fine depth adjustment ring, 6" base dimension, spindle lock, weighs 10.1lbs. Includes: motor pack, fixed base, plunge base, 1/4" & 1/2" collets, wrench, sub-base concentricity gauge, large hole sub base, vacuum adapter, kit box. Cuts fiber cement siding up to 5/16" thick with a smooth, fast, and dust-free operation. Based on a 1/2", 6.5-amp motor. Reversible blades machined from solid tool steel. Heavy-duty power for fast, clean cuts. Multi-slide scale and index system for accurate plunge depth adjustment. Variable electronic speed control with soft start switch prevents torque kick-back. Three position adjustable handles provides more comfort and control during use. Lightweight design facilitates maneuverability and ease of use. Optimal for fine milling applications. Exclusive accessory pack comes standard. STANDARD EQUIPMENT: Straight guide, bar holder, feed screw, 3 wing bolts, 11/16" template guide, wrench, straight bit, chuck sleeve, template guide adapter, 2 lock springs. SPECIFICATIONS: 15 Amps, 3.25 horsepower, 1/2" max collet capacity, 8,000-20,000rpm no-load speed, 2-7/16" plunge stroke, spindle lock, base dimensions 7-3/32" x 2-3/4". Full wave electronic variable speed motor with soft start runs, rack and pinion depth adjuster, integral dust collection system, spindle lock button, rubber-coated knobs have plunge-lock and on/off built-in, one-piece motor shaft and spindle ensures perpendicularity and accuracy, guide Bushing adapter plate accepts standard guide bushings for template work, phosphorous bronze bushings provide a smooth and accurate plunge, micro-fine depth adjuster. Specs: no load speed 8,000-24,000RPM, 1/2", 1/4" collet dia., 2-1/8" plunge stroke, depth stop 3 stage turret stop, base dimension 4-5/16 x 6-1/4", spindle lock, weighs 9lbs. Includes: 1/4" and 1/2" collets, template guide bushing adapter, wrench. Electronic five speed motor accommodates various router bit cutting diameters and applications, soft start feature reduces torque at star up and motor maintains constant speed under load, auto release collet system allows for easy bit removal after use, precision machined aluminum motor housing and base, base includes large integrated cast handles for stability and durability, dust sealed switch and sealed ball bearing construction. Specs: 120/AC, 60Hz, no load speed: soft starting 5 speed at 10,000, 13,000, 16,000, 19,000, and 21,000 RPM, 4.2" motor diameter, 1/2" collets, 7" round base, LxWxH (11"x7"x11") weighs 14.5lbs. Includes: router motor, fixed base, 1/2" collets, collet wrench, operating manual. Self-supporting motor with vibration decoupling for ideal vibration and noise reduction. Powerful 350 watt Fein high performance motor for optimal cutting speeds and maximum work progress. High quality and stability thanks to metal gear case and consistent use of ball or needle bearings. Lightweight tool at only 3.1 lbs. Tool cord length of 16.4'. Convenient Quick-In rapid-clamping system. Electronic speed control with generator for constant speed, even under load. Integrated interface for mounting additional accessories. Soft-grip zone provides optimal handling. Starlock tool mounting for ideal torque transfer. Kit includes: 1 Fein MultiMaster FMM 350QSL, 1 backing pad, 3 of each sanding sheets (grits 60, 80, 120 and 180 perforated), 6 sanding sheets 4-1/2" perforated (2 of each grits 60, 80 and 180), 1 dust extraction assembly, 1 rigid scraper blade, 1 E-Cut long life saw blade (35mm), 1 Universal E-Cut saw blade 1-3.4" (44mm) (type 152), 1 E-Cut long life saw blade (65 mm), 1 HSS segment saw blade, 1 carbide segment saw blade, 1 carbide rasp (triangular) and 1 hard tool case.